If you have diabetes, your physician will recommend more frequent eye exams to ensure high blood sugar levels are not affecting your vision. Good optometric care can help to detect problems in the early stages, when they care be managed more easily. At Riviera Opticare in Scottsdale and Mesa, AZ, we carefully monitor our patients with diabetes for signs of diabetic retinopathy. Diabetes is a metabolic condition in which the hormone insulin is not produced or is not utilized by the body normally. This can result in high level of glucose in the bloodstream, which is associated with damage to blood vessels. Blood vessels in the eyes are particularly vulnerable because they are small and delicate. As a result, they may experience bleeding, leakage of fluid, or scarring that damages light sensing cells in the retina, a condition called diabetic retinopathy. Individuals who have difficulty maintaining normal blood glucose levels are at risk for developing diabetic retinopathy. In addition, those who have had diabetes for many years are also at greater risk for the problem. Your optometrist in Scottsdale and Mesa can provide comprehensive eye exams that include dilating the pupils of the eyes. The dilation allows a closer look at the internal structure of the eye, where blood vessel damage occurs. If early signs of blood vessel damage are found, your eye doctor will make recommendations for further treatment of the condition. When you have diabetes, visiting your eye doctor frequently helps to ensure you will continue to have good vision throughout your life. 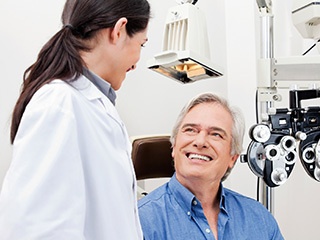 Your optometrist will ask questions about your health, your ability to maintain normal glucose levels, will carefully examine your eyes, and will offer advice if any problems are found. The optometrists and staff at Riviera Opticare are committed to providing quality optometry care for all their patients in Scottsdale, AZ, Mesa and neighboring communities. We offer comprehensive exams, eyeglasses, contact lens fitting, computer vision, dry eye treatment, care for eye injuries, and management of eye diseases. Call Riviera Opticare today, at 480-991-6432 in Scottsdaley or 480-827-9184 in Mesa, for an appointment to learn how we can help you maintain good eye health with regular eye exams.